FUJIFILM has introduced FUJIFILM X RAW STUDIO, new free conversion software that allows photographers to convert RAW files while maintaining image quality. Compatible with Mac and PC, image conversion is designed to be fast, as the software uses the camera’s X-Processor Pro engine instead of a computer’s CPU to process files, individually or as part of a batch conversion. FUJIFILM X RAW STUDIO for Mac is available now; the PC version is scheduled for February 2018 availability. Additionally, firmware updates were announced for the FUJIFILM GFX 50S and X-T2 and X-T20 cameras. You can read our hands-on review of the GFX-50S. And among the feature updates for the FUJIFILM X-T20 with firmware update v1.1 is touch-panel operation while looking into the EVF. Get more download information, and visit the Fujifilm website. Valhalla, N.Y., November 29, 2017 – Fujifilm North America Corporation today announced the launch of FUJIFILM X RAW STUDIO, a new conversion software that allows photographers to quickly and easily convert RAW files while maintaining outstanding image quality. Also available today are Firmware updates for the FUJIFILM X-T2 and X-T20 X Series cameras, and the FUJIFILM GFX 50S. FUJIFILM X RAW STUDIO enables users to convert RAW files with ease, offering exceptionally fast conversions. Due to the size of RAW files, photographers can often find batch conversion extremely time consuming. X RAW STUDIO utilizes the connected camera’s X-Processor Pro high-speed image processing engine, allowing for quick and effective conversion without compromising on image quality. Compatible with both Mac and PC systems, the new X RAW STUDIO enables batch conversion of a selection of images. Users can store conversion settings or copy settings between images, and variable image processing conditions can be adjusted in the same way as in-camera RAW conversion. Supports single or batch conversion for RAW images through a Mac or PC system. Image processing settings can be adjusted like the in-camera RAW conversion. All conversion parameters available through in-camera RAW conversion are adjustable, enabling photographers to monitor results in a preview window when changing settings. Displays before and after images side-by-side for easy comparison while changing adjusting settings. Enables users to save, load, or copy conversion profiles onto another RAW image. FUJIFILM X RAW STUDIO for Mac is available now, and is set to launch for Windows in February 2018. X RAW STUDIO is available to users at no cost. Fujifilm has released firmware updates for the GFX 50S that add new support for FUJIFILM X RAW STUDIO, improved third party studio flash controller usability and new functions to improve operability. Supports Instax SHARE SP-3 and higher resolution prints for SP-2. Addition of “Eye Sensor + LCD Image Display” in View Mode that allows for shooting through the viewfinder and checking images on the LCD. ON/OFF for 1/3-step shutter speed adjustment. Addition of “Shoot Without Card” mode so camera will not shoot without SD card inserted. Addition of “-6” and “-7” to EVF’s brightness settings. Additionally, Fujifilm has released firmware updates for the FUJIFILM X-T2 and X-T20 X Series cameras to add new functionality and improve operability. 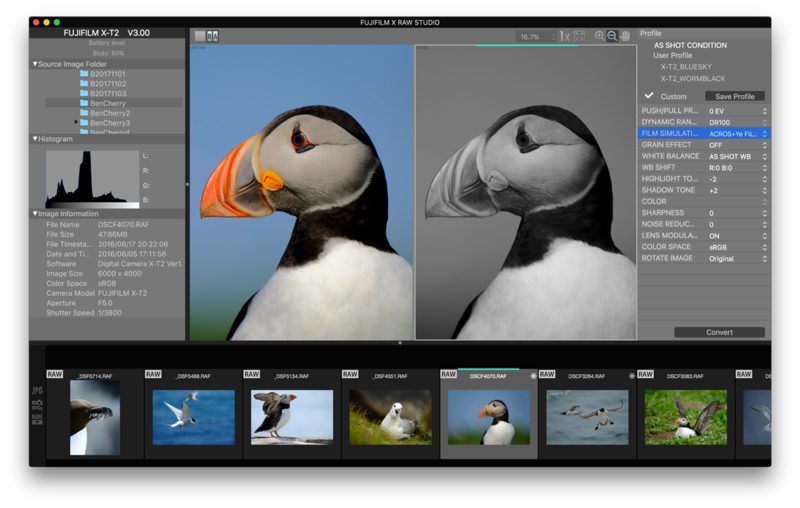 These updates include new support for FUJIFILM X RAW STUDIO, dramatic improvements to the AF-C tracking algorithm in zone and tracking AF mode, addition of 4K video support and computer tethering functions and enhancements to touch panel operations. Allows users to choose RGB and brightness histogram with or without highlight warnings. Touch panel operation while looking into the electronic viewfinder.